I have tried to make my own stencils on several occasions without much success. It is difficult enough to cut curves and complex angles, but I find it virtually impossible to cut a precise outline stencil. Cutting Edge have come to the rescue with two sets of stencils produced in their "Black Magic" self-adhesive vinyl material. These sets cater for 1/32 and 1/24 Luftwaffe fighter aircraft. This is particularly pleasing because after-market decals are scarce in 1/32 scale and non-existent in 1/24 scale! They produce the ultimate "painted on" look with no risk of decal film. 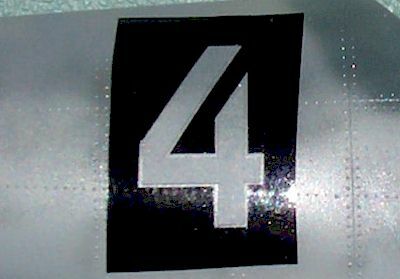 Gruppe Bar markings are supplied to suit II and III Gruppe aircraft, but IV Gruppe squiggles are not included. Kommandeurs' Chevrons are not included in these sets. 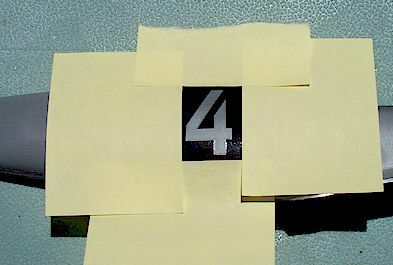 A review of the Black Magic Luftwaffe Number Masks, along with spinner spirals and German national marking stencils in the same scales, may be viewed by clicking here. There is no doubt that these masks require more planning, care and time than decals. However, considering the amazing choice they represent in these neglected scales, the extra effort will be worthwhile. I tested the masks using a complex-shaped, outlined number. I can recommend the following eight-step method for applying these masks. 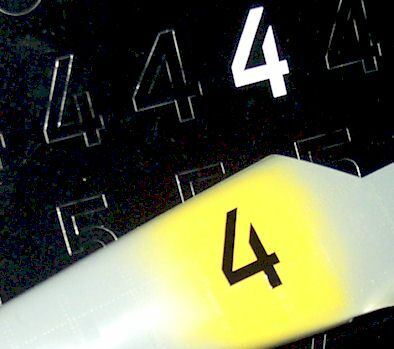 The general area to receive the marking is sprayed in the colour of the marking. 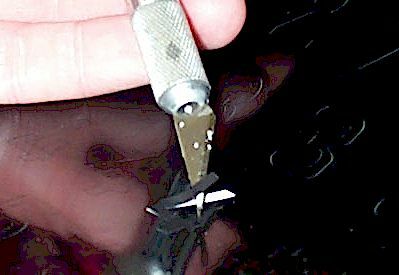 The narrow, centre stencil is carefully lifted from the "Black Magic" sheet with the assistance of a sharp hobby knife. Make sure that the vinyl mask does not stretch during removal or later handling. 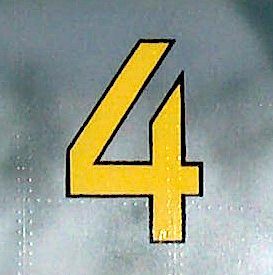 The appropriate style of number is carefully positioned on the model over the pre-painted colour patch. If necessary, the mask may be lifted and repositioned before the next step. The adhesive is quite forgiving. Camouflage colours are sprayed over the mask. 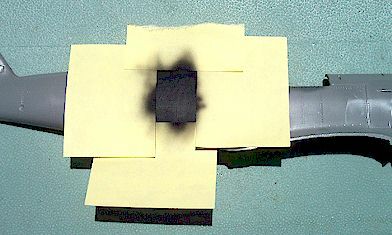 Only a faint outline of the raised mask remains in this view. For outlined numerals, apply the larger outside mask from the second "Black Magic" sheet. Do not remove the inner mask yet! Make sure that the outline leaves an even gap around the inner mask. Mask around the outline mask using your favourite masking medium. I prefer to use "Post-It Notes" for simple masking jobs. They are self adhesive and come in a range of sizes. Spray the outline colour over the mask. The paint should be quite thin and applied in misting coats at various angles to ensure good penetration in the narrow gaps. 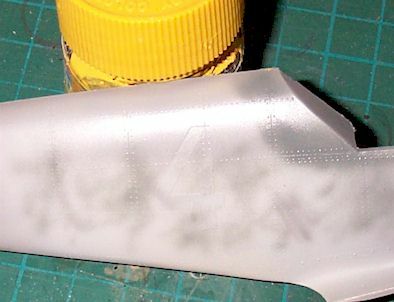 Remove all the masking material and you have a beautiful, film-free, painted marking in your choice of colours. My first experience with Black Magic's Luftwaffe Number stencils was an unqualified success. It is a shame I will have to eventually strip the markings from the unassembled fuselage half! I have no doubt that the German national markings and spinner spirals will be equally pleasant to work with. 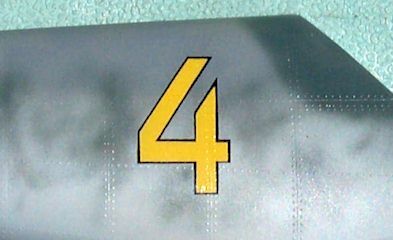 These markings offer unprecedented choice to modellers of 1/24 and 1/32 scale aircraft. With care, the quality of the result is as good as the best available decals but without the risk of visible decal film or silvering. I hope that Cutting Edge also release chevrons and alternate Gruppe markings in these scales; and similar products in 1/48 scale.